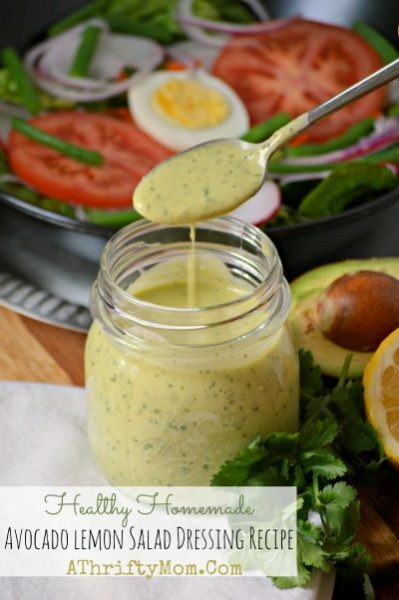 One of my most favorite dressings is this Healthy Homemade Avocado Lemon Salad Dressing Recipe. We are finally having some beautiful weather here. When we have nice weather I eat a lot more salad. I tend to eat the same salad combos but like to mix it up with different salad dressings. This smooth and creamy avocado dressing is pretty amazing. I like it on green salad, pasta salad or even a corn and bean salad. Hope you enjoy it too. Blend everything in a blender or food processor until smooth and creamy. Add just a bit of water if you would like the dressing a little thinner. I do! Then adjust the salt. This makes about 1/2 cup or so (give or take). Depends if you like it a little thicker or not. It should last 2-3 days in the fridge – the flavor changes a bit. Of course you can double the recipe and adjust it to your taste if you tend to like it more or less with the acidity of the lemon/vinegar. Blend everything in a blender or food processor until smooth and creamy. Add just a bit of water if you would like the dressing a little thinner. I prefer my thin! Then add the salt. This makes about 1/2 cup or so (give or take). Depends if you like it a little thicker or not. It should last 2-3 days in the fridge. The flavor changes a bit as it ages. Of course you can double the recipe and adjust it to your taste if you tend to like it more or less with the acidity of the lemon/vinegar. This post contains Amazon links, price or selection could change at any moment. I love avocados. So making this!!! Sheryl Schumann, worth a try?